Replace your old IKEA Henriksdal chair covers with custom sofa covers for a unique look. Over 70 exclusive fabrics, 3 custom skirt styles and other customisations means this Parsons dining chair will look amazingly unique. Plus we offer a 3 year Guaratee and Free Worldwide Shipping! 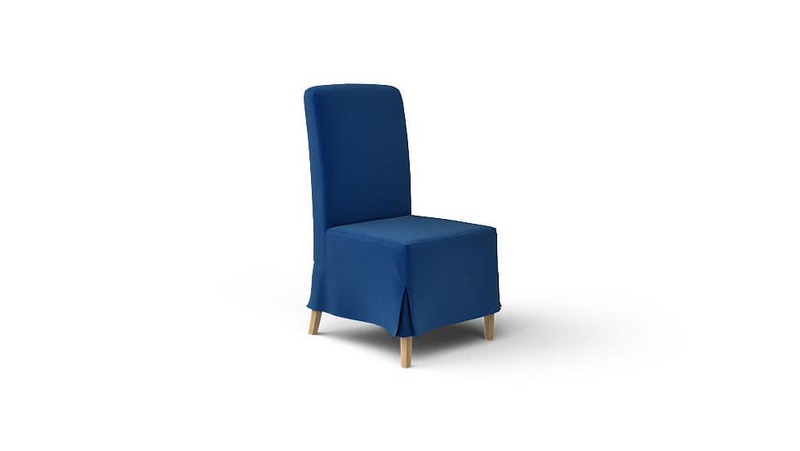 Custom made Henriksdal Slipcover for the IKEA Parson Dining Chair, don't mistake this with the Harry. The Henriksdal chair will have a wider seat width of 51cm or 54cm instead of 48 cm on the Harry. Throwing a party but feeling a little embarassed about how your IKEA Henriskdal dining chair covers look? Give them a quick, hassle-free and affordable upgrade with our custom IKEA replacement slipcovers. Pick from over 70 gorgeous fabrics, elegant customisations and enjoy free delivery to your doorstep wherever you are in the world. Because our slipcovers are machine-washable, you never have to worry about getting your dining chairs dirty. So just relax, have fun with your guests and should you get stains and spills on them, just take your covers off and throw them in the washing machine for an easy clean. This means that your newly-revived dining chairs will not only look better than brand new, they'll also be child- and pet-friendly.